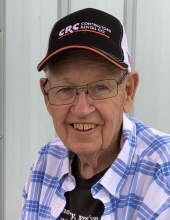 Larry Houghton, age 80, of Sheldahl, passed away on January 20, 2019 at his home in Sheldahl. Friends may call from 4-6:00 P.M. on Sunday, January 27, 2019 at the Soderstrum Funeral Home in Slater. Funeral service will be held at 11:00 A.M. on Monday, January 28, 2019 at the Harvest Assembly of God Church in Huxley. Burial will be at the Highland Memory Gardens Cemetery in Des Moines. Funeral arrangements are under the direction of the Soderstrum Funeral Home in Slater and online condolences may be left for Larry’s family at www.adamssoderstrum.com. In lieu of flowers, memorials may be directed to the family for future designation. Born on April 15, 1938 in Des Moines, Larry was the son of William and Cora (Bagley) Houghton. He grew up in Des Moines and attended East High School. After high school, Larry enlisted in the United States Air Force. He was united in marriage to Lois Simpson on December 27, 1958 at Berean Assembly of God Church in Des Moines. Together, Larry and Lois raised their four children. Larry was a plumber by trade but was very skilled and handy at many different things. He had a love for children and one year, turned his riding lawn mower into a train in order to haul kids in parades. Larry enjoyed fishing and was also extremely artistic. Painting was a favorite past-time. Larry was a member of the Harvest Assembly of God Church, where he was often found using his talents and makings improvements around the church. Larry was a teacher of the Word and loved to talk about the Lord to anyone. Larry is survived by his wife of 60 years, Lois; his children: Larry (Robin) Houghton of Sheldahl, Laura Stratton of Tucson, AZ, Leigh Houghton of Perry, Lathan (Brandi) of Juneau, AK; 5 grandchildren: Jason Stratton, Janae Kester, Landon Houghton, Jessica Miles, Heidi Houghton; 15 great-grandchildren; and a brother, Rev. David (Wynetta) Houghton of California. He was preceded in death by his parents; and his siblings: Mildred Houghton, Margaret (Keith) Miles, Gladys (Al) Johnson, Naomi (Richard) Lendon, Pete (Fanny) Houghton, Dwight (Colleen) Houghton, Rev. Ralph Houghton, and Tom Houghton. To send flowers or a remembrance gift to the family of Larry Houghton, please visit our Tribute Store. "Email Address" would like to share the life celebration of Larry Houghton. Click on the "link" to go to share a favorite memory or leave a condolence message for the family.